Today marks the anniversary of the assassination of Malcolm X. On February 21, 1965, Malcolm X was shot before he was about to deliver a speech in Manhattan about his newly formed Organization of Afro-American Unity. Only 39 years old, he was a man who left a significant impact on the world in his shortened life. Within the condensed history of the Civil Rights Movement, Malcolm X is often portrayed as a radical, controversial figure and even a threat to peace. Luckily, there are many books and recordings available for us to revisit the context of such bold statements as “If ballots won’t work, bullets will,” which did not make him popular among Americans. The violent radical narrative draped upon him by the media has to this day made Malcolm X misunderstood. 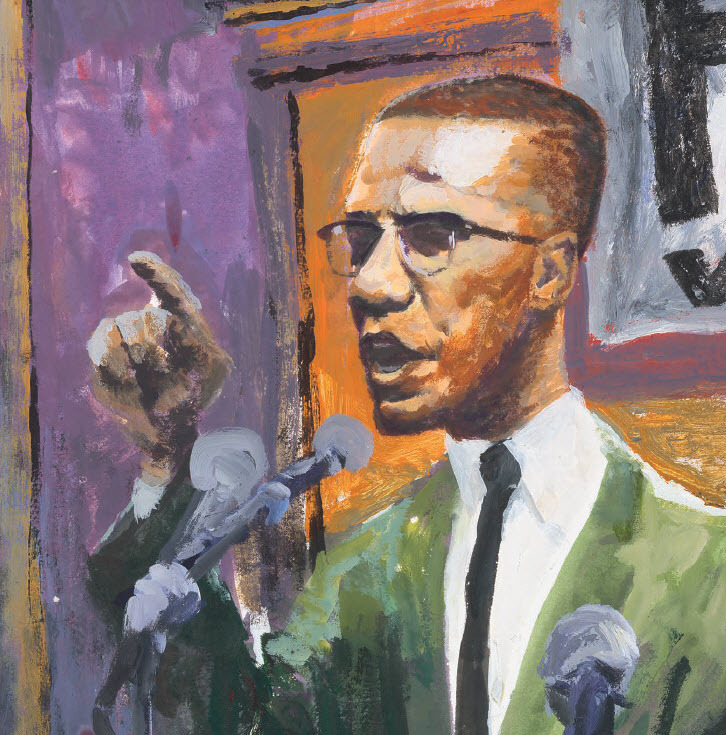 Malcolm X was a frequent visitor to the National Memorial African Bookstore, and he plays a vital role in Vaunda Micheaux Nelson’s beautiful picture book, The Book Itch, winner of 11 awards including the Coretta Scott King Illustrator Honor. In the 1930s, Lewis Michaux Jr.’s father had an itch he needed to scratch—a book itch. How to scratch it? He started a bookstore in Harlem. People from all over came to visit the store to swap ideas and talk about how things could change. They came together here all because of his father’s book itch. When Malcolm X was gunned down on February 21, 1965, few were shocked by the news of his death. Since 1952 the former member of the Nation of Islam had supported the Nation‘s philosophy of violence as the method to achieve justice for blacks in the United States. But in March 1964, after a major shift in his philosophy, Malcolm changed his message. He no longer agreed with the Nation of Islam and feuded with its leaders. In this chronicle of an assassination, find out the answers to the questions about who assassinated Malcolm and learn more about the impact of Malcolm X‘s life, and his death, on civil rights in the United States.